A year or two as an auxiliar in Madrid is an exciting and invigorating experience. I make enough money to live comfortably in the city and still have plenty of time to explore, travel, and look for the answers to the umpteen questions all twenty-somethings have. It's really an amazing deal, and I'd recommend the experience to everyone willing to take a leap and embrace their independence. As you know, my situation is slightly different from some of my American friends. Although we are all attempting to answer those questions I mentioned above, many auxiliars I know are doing so while keeping in mind they will be returning home in a year or two. Although I have (slowly..) found some passion in teaching English and began to hold some meaning to my work here, we all know the real reason I came to Madrid was to be with the person I love. And although I know I will be here for another year, what lies beyond that is truly unknown. Really. I literally have no idea where in the world I will be after two years.. Nacho and I talk a lot about living in different countries. We discuss where he may have the best opportunities as a bilingual civil engineer, and also what my opportunities are in those places. The United States is high on the list, but not definite,and because of that both of us are open to living in other countries. Of course in this moment we are only throwing ideas out on the table; Denmark, Singapore, Brazil, Chile..the list goes on. For me this is super exciting. I feel energized thinking about the endless opportunities and paths before me. I have always embraced the idea of living a 'global life,' one which is aware of cultures, people, places, lifestyles different from my own. But since my time living here, I have realized that an extreme amount of patience, energy, effort and intention MUST go into each and every day in order to live it well. To live far from home (and by home I mean physically close to family and those who love you, and also submerged in all that is familiar and comfortable, or mundane) requires a person to live with intention. Now, I'm not saying that this isn't required of those who live where they know. To be happy anywhere requires living an intent life, this is for sure. But to live in a foreign place seems, for me, to require a little extra something. An intention to make what is uncomfortable, unknown, or unfamiliar just the opposite. To embrace new routines. To put yourself out there in an endless number of ways. And to be able to live with the (constant) pang of homesickness. These are daily realities. For a traveler, they are exciting, amusing, enjoyable even. But adding a sense of permanency to the situation changes things, and life in a foreign place gets harder. I can do it now. I like to do it now. Can I do it in two years? Can I do it in three years? Can I do it for ten or twenty or thirty years? For those of you who have spent time in any Spanish home, you know what I'm talking about when I say Cola-Cao. Similar to Nesquik, this powered chocolate drink is an absolute staple in every house and cafe in Spain. It is drunk hot or cold by people young and old and it is EVERYWHERE. Back in my skyping days with Nacho, I recall many times seeing him sit in front of the computer drinking a cola-cao. I didn't think anything of it, really. But now that I have stayed in his house and talked with my students at the school, I realize that a day does not go by without most people having one of these powdered chocolate milk drinks. Their popularity astounds me because, if we're being honest here (and Nacho don't read this..) it really doesn't taste all that good! I mean, those of you back home I'm sure you've had nesquik, right? But if you're gonna make chocolate milk you go for the good stuff- Hershey's chocolate syrup (which they don't even sell here, nothing Hershey's at all!). 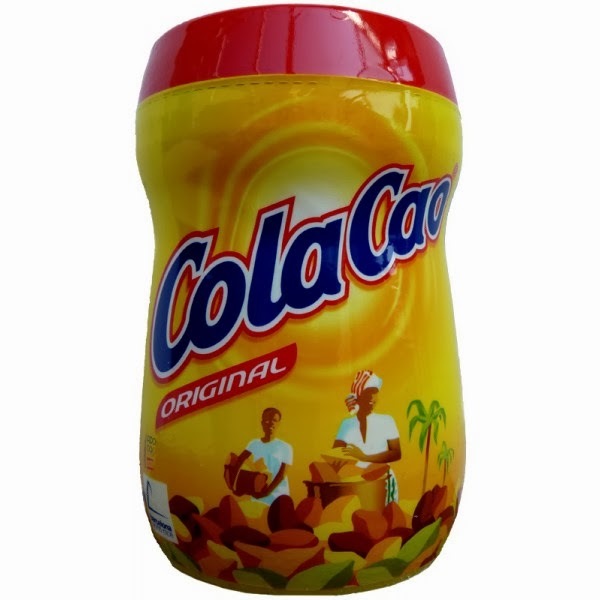 But nevertheless, when I ask my first year students what they have for breakfast every morning, without fail every single one says a cola-cao. When I order a coffee at a cafe, I see adults around me having a cola-cao. It seems to be the answer to everything- breakfast, lunch and dinner. I guess it's just one of those things I won't ever fully understand.. and thanks to dating a Spanish man I too now have this yellow container forever on my shelves. Cochinillo. Better known in English as a suckling pig. I have been told by Spanish friends that I MUST try a cochinillo in Segovia. I was in luck! 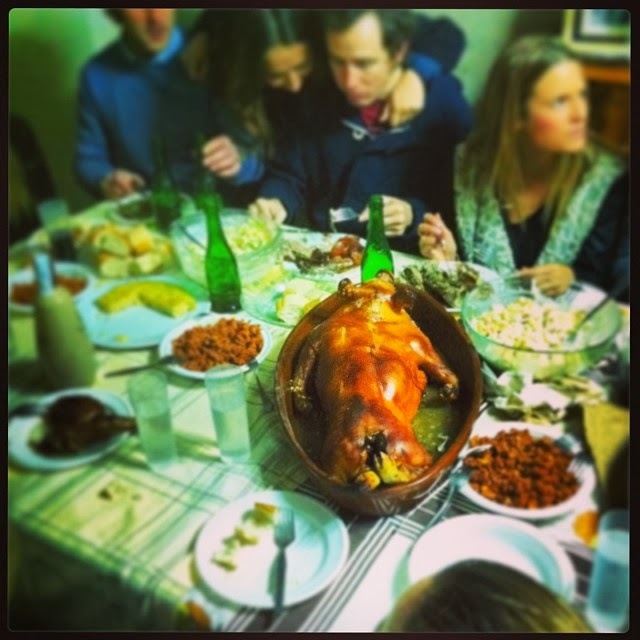 Every year Nacho and his friends have a big annual cochinillo lunch in Miguelañez, Segovia. So on Saturday, after a long morning of working for Nacho, we drove northwest of Madrid for about an hour and a half to the family home of Andrés, a friend of Nacho. With 15-20 people and two babies there was never a dull moment, but the day was filled with laughs, love and lots of food! Living in the city can be frustrating. The days can be long and the crowds can grow tiring. The noise and movement get old and my job downright exhausts me. Lately I've been thinking about routine. Routine. Routine. Routine. Monotonous adult life which I have been running from since I can remember has still found a way to creep up on me and take over my days. Work, grocery shopping, laundry, budgeting, bills, student loans and student loans and student loans. Moving out of the country did not (as I'll admit part of me secretly hoped) stop responsibility and monotony from having a strong presence in my daily life. But these are realities and they will not go away. And what I struggle with is not trying to ignore or change the realities of monotonous adult life, but to accept them and live with them with acceptance, graciousness and patience. To accept the realities and keep perspective at all times that while I may not be able to change the at times monotonous responsibility of everyday life, I do have complete choice over my attitude, my acceptance, and my actions. This commencement speech sums things up perfectly. I am officially renewed to teach English in Spain for the 2014-2015 school year. I have chosen the same Community- Madrid, but asked for a new school that is closer to the city center where I live (fingers crossed for no more 3 hour commutes). I find out if and where I am chosen to teach sometime in April/May so I will keep you all updated. The plan is to come home July 15th, and then I'm back here again in mid-September. Although I would love to travel around as I am SO close to so many places I want to see, my reality is my unfortunate student loans. Between those payments plus a plane ticket, you probably won't see me going anywhere special. At least I have this beautiful city to explore! And a wonderful person to share it with.